Camping? In Mexico??? The US customs officer in Douglas, AZ asked in a very offended tone when we got back from our expedition. He and his colleges waved us away from our vehicle and sorted through coolers, sleeping bags, tents, camera bags and dirty underwear. No, we did not transport back any beetles or plants. Not even in our gas tank. Our specimens were transported and declared by Tom Van Devender who by now has ample experience with permits, legalities, paperwork, and office hours on both sides of the border and who safely brought back everything to pass on to the respective experts for identification. All I brought back are photos. Our expedition took us to the Cuenca Los Ojos Foundation properties in the Sierra San Luis. So From the border crossing in Douglas, we headed southeast, through Agua Prieta, Sonora, and then continued on highway 2 not quite to the border with Chihuahua. A winding dirt road took us to the main house of the Rancho los Ojos. Beautiful big cottonwoods shaded our campsite close to the river, but as the wind picked up towards the end of our stay it was more comfortable to move into the ranch house. After roughing it on a deflated air mattress, a room with original art on the walls and a great modern bathroom were a welcome change. 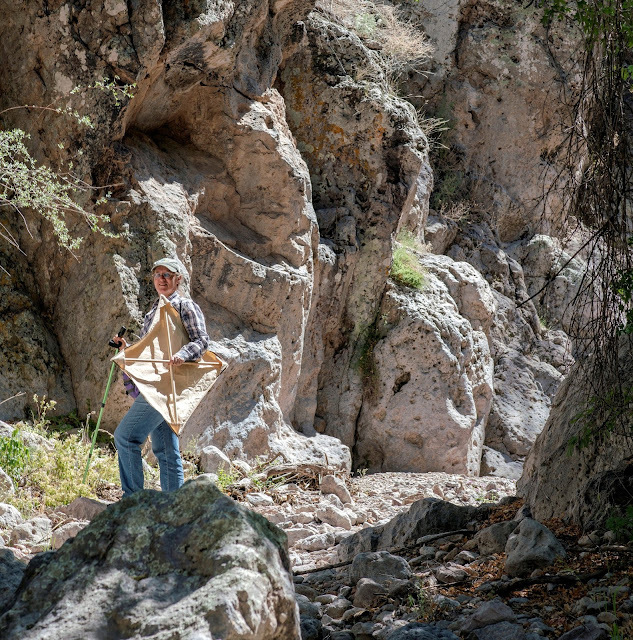 The huge area that is owned by the Cuenca Los Ojos Foundation consists mainly of rolling high elevation grasslands that are dotted with mesquite, juniper and 8 species of oaks. Smaller neighboring ranches that have been acquired recently include also pine forest, but we did not get that far on our tours because we were too engaged in exploring creeks, washes and slot canyons on the way. In these parts, April is definitely part of the dry pre-summer time. The mesquites were fresh and just greening out, but the grasses were brown and brittle. It could be (and was) much worse. Since buying the land, the owners of the Cuenca los Ojos have used exemplary methods to revitalize the area, conscious that it contains the hinterland and the headwaters of the Rio Yaqui and therefore determines the health of this enormous drainage system with effects far downstream in other parts of Mexico. Of course, the ranchos were originally cattle grazing grounds. But we hardly saw any cattle. There were active salt licks everywhere, indicating the presence of some cows, but. access to the river tributaries was fenced off. 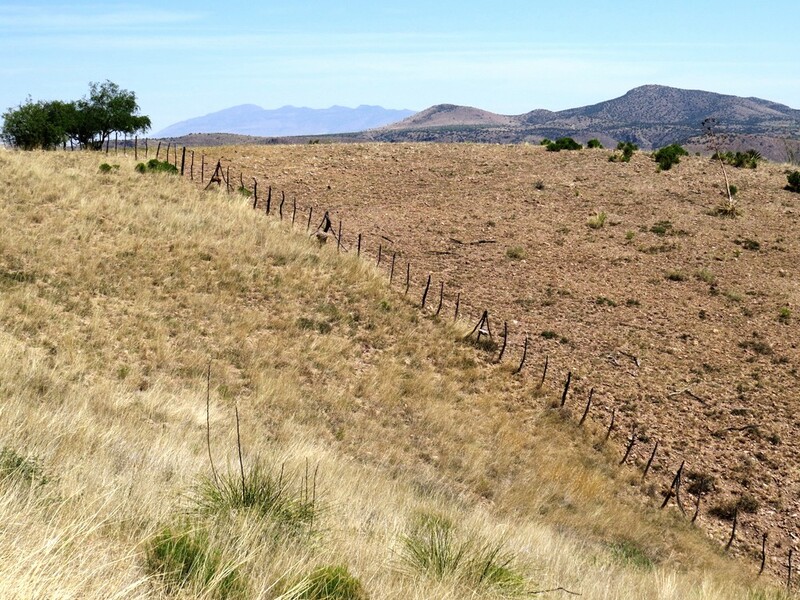 The main feature of the foundation property are thousands of check‐dams or gabiones. They reminded me of artificial beaver dams (without the beavers’ tree harvesting, though). But like beaver dams, these structures retain water, turning grassland into swampy cienegas, preventing erosion by seasonal flood-runoffs and instead allow permeation of water into the soil. We saw some old photos of the property: rather barren grassland cut through by dry arroyos. Today, lush galleries of cottonwoods and willows accompany permanent water flow. The owner who considers this restoration her legacy, hopes that this ‘sponge’ in the head-waters will benefit the entire Rio Yaqui and sees the rancho as a model for other restoration projects. So students and scientists are welcome visitors. We were there to continue the exploration that earlier expeditions had begun. Birds, mammals, Fish, herps and plants, even moths to some degree, had already been listed. But for most insects, the project is certainly still ongoing. 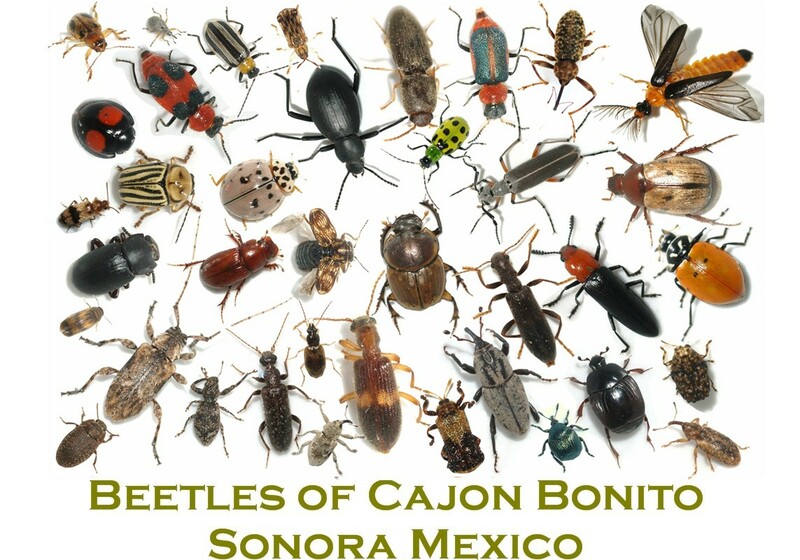 Many of our finds might even be first records for Sonora. So it was great to join a substantial group of ASU, UA, and U of Hermosillo scientists in one of the world’s hot spots for biodiversity. Not carrying a kite, but an unusually small beating sheet. Nico’s was three times as big, so he got more beetles, obviously! So the place temporarily became rather dangerous for the local bug population, especially when during daylight hours opportunistic Thrashers and Orioles joined in and cleaned up the black lights at the kitchen door of the ranch house. We had moth and micro-moth, Curculionid, Cerambycid and Tenebrionid, Odonata, Ant and Butterfly experts, but True Bugs were nobody’s favorites. But we encountered a great number of interesting species. 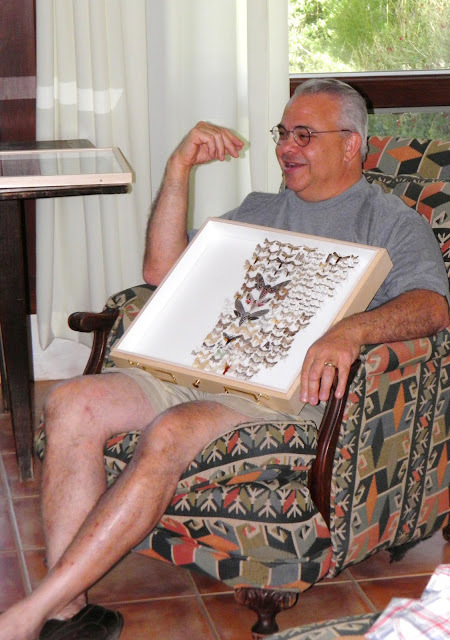 During an hour-long stop at Punta del Agua Doug Danforth contributed nearly 20 species of Dragon and Damselflies to the lists. We had several people who specialized in mites. Other Arachnids were also plentiful. 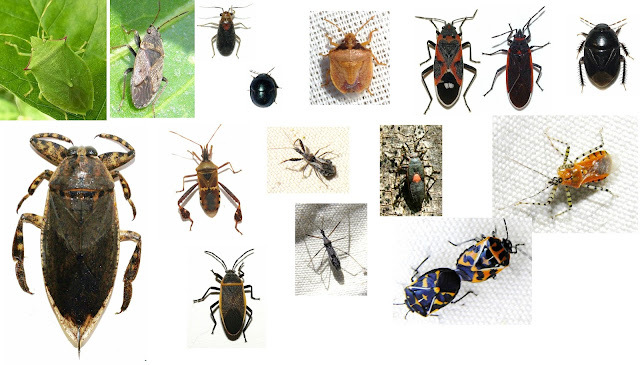 Beetles, all – what, 6000 + (?) – Sonoran species of them, are my main interest. Sonora is considered one of the world’s most species-rich locations, but so far there are few good data available. So even species that are well-known from Arizona may get their first valid record for Sonora from our collection efforts. That really makes it a lot of fun. I also found a few that will be useful for my Arizona Beetle Book – those are species that are known to occur in AZ but I saw them for the first time on this trip. 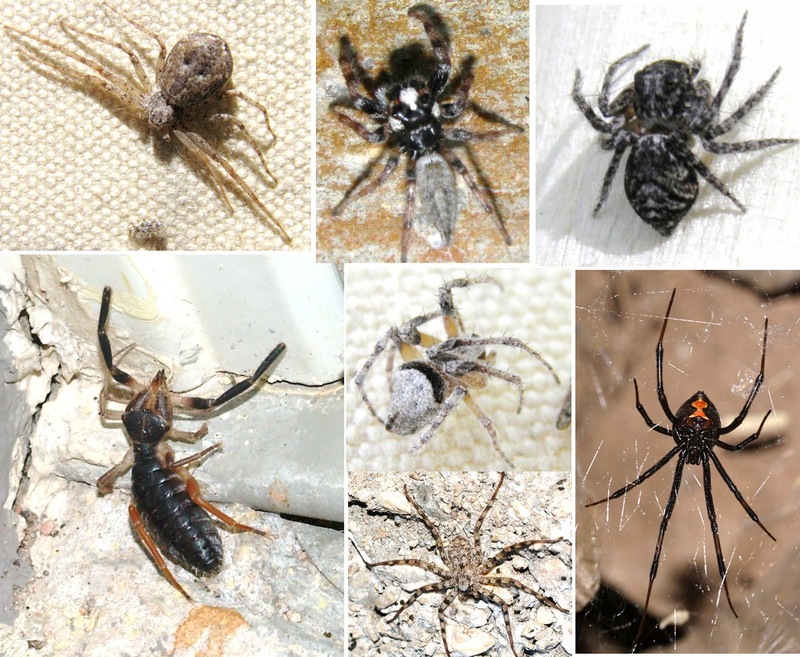 Surprisingly, we found a number of species that in the US don’t occur west of Texas. Over all, I personally ended up with over 70 species of beetles. The numbers would have been higher if windy conditions hadn’t made collecting difficult in the last days. We are also way into the dry season. During the summer monsoons, this area must be extremely rich. The vegetation on the way to the hot springs of Ojos Calientes was especially lush (even after our botanists were through collecting) and revealed a number of interesting reptiles: First a Patchnose Snake and a Sonoran Whipsnake (that one escaped without having its picture taken). After a very pleasant soaking in the natural hot tub, Anna Lilia and I ran into a pretty little Gila Monster, the first of three that were eventually found. 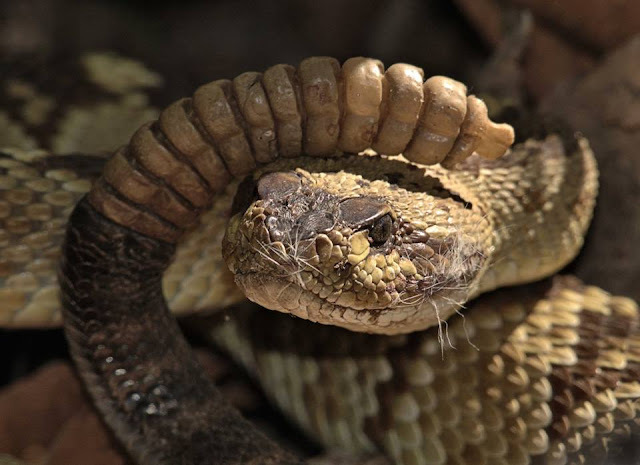 ‘Herpers’ like Tom van Devender and Jim Rorabaugh do not let these lizards and snakes go without providing teachable moments. Touching and comparing the smooth scales of snakes and the hard, beady ones (each with a bony core) of the monster’s back was a memorable first for several participants. 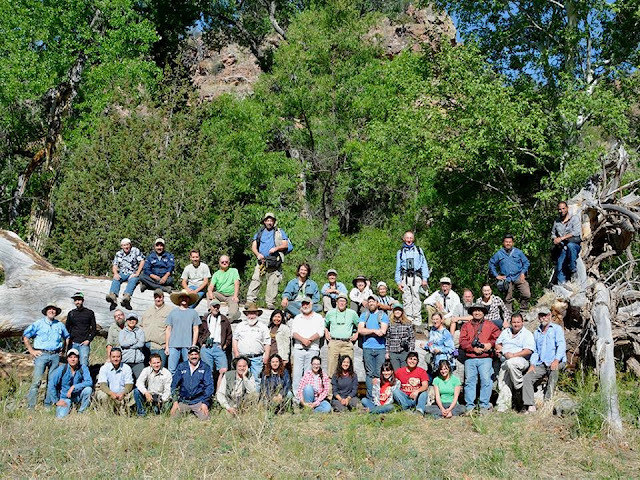 On our Sonora excursion, we are always cared for by la Comisiòn Nacional de Areas Naturales Protegidas, CONANP. Their cooks prepare our meals, and I often come home with new simple, but nicely spiced recipes. So Randy benefits at least a little from my travels. Chip Hedgecock took the obligatory group photo with all of us perching on the huge trunk of a dead Cottonwood that had been hardly diminished by a three-day axe-attack on it by our tenebroid people. 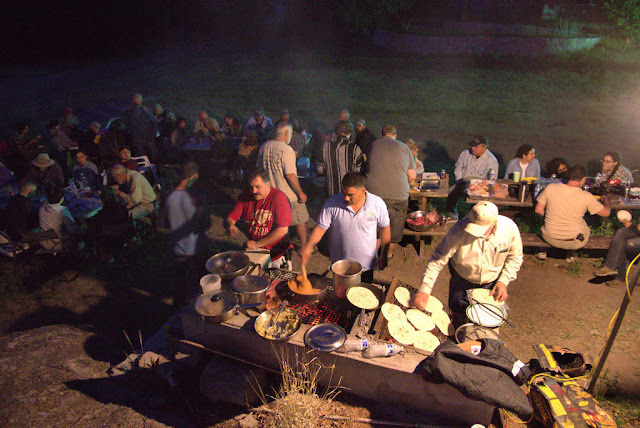 This memorable expedition was sponsored by GreaterGood.org, hosted by the Cuenca Los Ojos Foundation and prepared and led by Tom Van DeVender and Analilia Reina – thank you so much for making this possible! Margarethe Brummermann received her Ph.D. in Zoology/Physiology from the Ruhr University in Bochum and the Max Planck Institute for Cardiovascular and Pulmonary research in Bad Nauheim, Germany. She has worked as a biologist at universities in France, Norway, New Zealand, Florida and Arizona and since 1995 owns her art business Brummermann’s Art and Science, selling her watercolors and photographic insect collages. She is currently preparing to publish an illustrated Field Guide to Arizona Beetles with co-author Arthur Evans. To share her enthusiasm about natural history and art, she writes two blogs: Arizona Beetles, Bugs, Birds and more http://arizonabeetlesbugsbirdsandmore.blogspot.com/ and Margarethe Brummermann’s Watercolors http://margarethebrummermannwatercolors.blogspot.com/ and maintains the Facebook group Arthropods of SW US and NW Mexico https://www.facebook.com/groups/SWInsects/ and publishes a popular series of insect posters https://flic.kr/p/TkSjA8. Our efforts to explore, understand, document, and protect these hotspots has been a success, as five Sky Island regions are now protected areas. With each new mountain range comes at least one new species, making these expeditions some of the most exciting and important of our time. To say we can hardly wait to explore each new range would be an understatement!